4 LINES, up to 18 chars per line. Description: 1.800 metre wide x 1.200 metre high Sign Face area. Supplied 90% assembled. Legs/wheels need to slip into master frame. 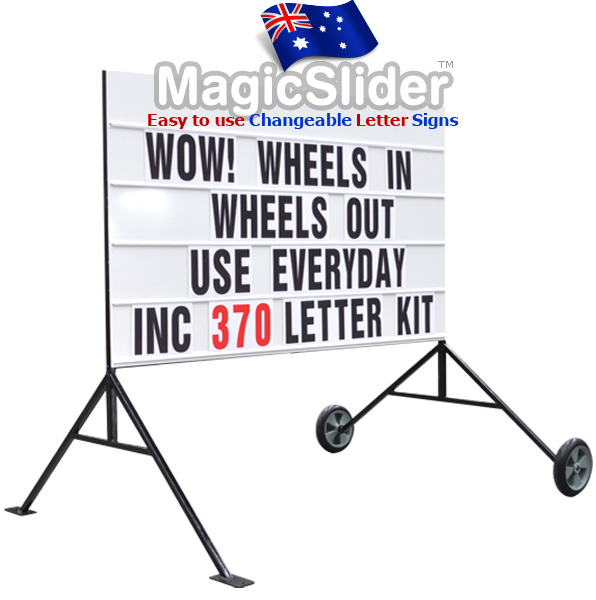 "This large sized outdoor changeable sign on wheels is a brilliant product and includes the full alphabet letter set" allows you to position the sign with ease. Notes: Its easy to wheel in and out and includes extra wide feet for added stability Plus bonus oversize PEG holes on feet. Packaging Details: Protective Cardboard outer. Boxed letters, Wheels/struts. 3 packages. 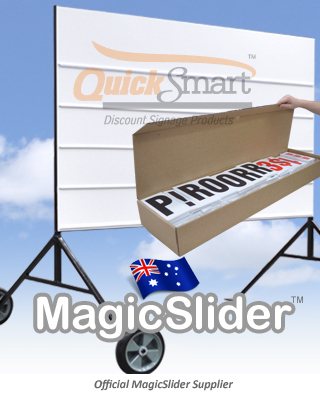 This changeable sign for sale is purchased Australia wide and used by hundreds of people eveyday to advertise their products for sale, show daily specials, advertise new products, special offers etc. Optional > you can also ask your local sign company to signwriter paint the top panel with your logo or company name or ask our team to supply your signwriting. This sign is sold to trade and public direct. The full letter set includes popular letter groups and additional series for double sided use. Over 370 panels are included within each set. 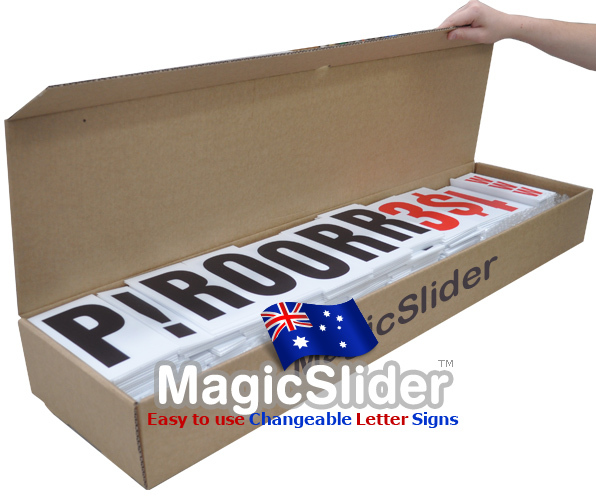 Huge 4 line slide system and header area, This is a very popular signage system made by Australia Signs. Each line can hold up to 18 letters or numbers. 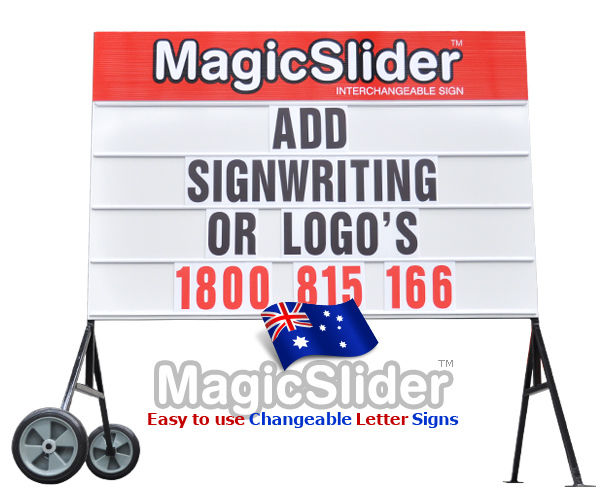 The swappable changeable sign is ideal for advertising signs, road signs, event and public directional. Includes 370 letters, numbers & symbols kit, wheels & frame slides. 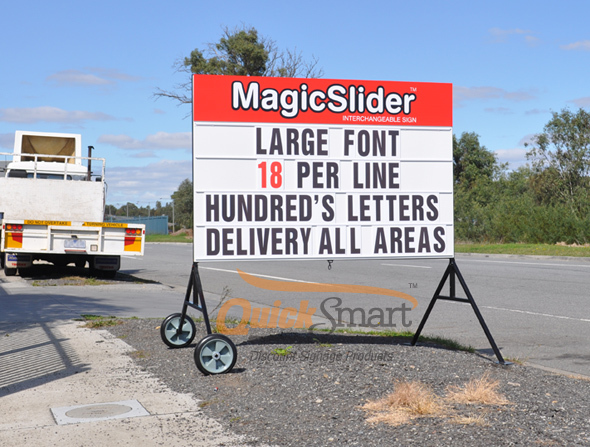 Changeable sign on the street road side with large font and 18 characters per line including 370 letter panels for signwriting. Delivery to all areas and you can also signwriting your business name and logo. Powdercoated coated black / baked white. Special Note! Shipping is quoted for your suburb. This large sign is packed in 3 packages. Shipping calculator is guide only†. Our team will quote delivery formally via telephone.